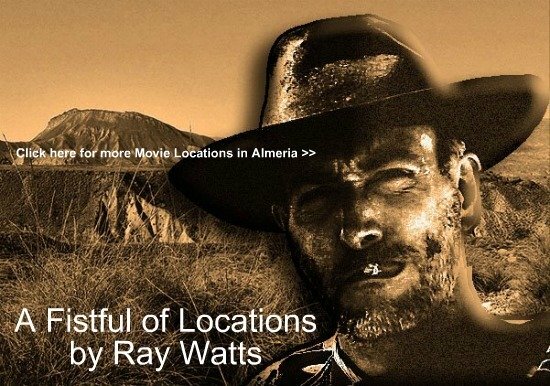 Apart from Sergio Leone's spaghetti western movie filming locations, Almeria was the backdrop for many other movies. In addition to the mountains of Arizona and Mojave, the Desert of Tabernas also represented the Middle East desert to be seen in movies such as 'Cleopatra'(1963), 'King of Kings' (1960) or the winner of seven Oscars 'Lawrence of Arabia' (1962). The latter, directed by David Lean and starring Peter O'Toole, was the most important one with a budget of 20 million dollars, and it was the movie that established Almeria's future path to further super productions. During the shooting, which lasted five months, other locations of Almeria City were used such as the Nicolás Salmerón Park, which pretended to be Damascus and Cairo - and The Natural Park 'Cabo de Gata' , which was the backdrop for the famous scene of the train bombing. For this purpose, two entire systems were purchased from RENFE (the Spanish Railway), consisting of locomotives and rolling stock, and a two and a half mile track was built along the beach.. The cathedral square was used to represent the allied troops at Messina which left the square bare of trees and full of sand and tanks. In contrast to all that past activity and bustle, the cathedral today is Almeria City's most peaceful and pleasant place to visit, particularly it's renaissance cloister surrounded by palm trees. 'How I Won the War' (1967), Richard Lester, Director, 'Conan the Barbarian' (1981), John Milius, Director 'The Empire of the Sun' (1987) and 'Indiana Jones and the Last Crusade' (1989), Steven Spielberg, Director; 'Pájaro de la felicidad' (The bird of happiness) (1993), Pilar Miró, Director 'Bwana' (1996), Imanol Uribe, Director and 'Poniente' (West) (2002), Chus Gutierrez, Director, are some of the many films that have benefited from this photogenic piece of untouched Mediterranean coastline: 60 miles of cliffs, wild dunes and beaches that stretch from the suburbs of Carboneras to Almeria City: definitely one of the best movie filming locations. 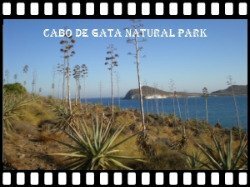 Halfway between the lighthouse and San Jose, there is another excellent movie filming location in Cabo de Gata Natural Park. 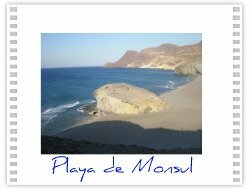 When entering the dirt track from San Jose to the pintoresque beaches Monsul, Genoveses and Playa de Media luna, an awesome landscape strikes the visitor. First thing one will see at the right hand site, is a typical Spanish farmhouse, used as a setting in the western "For a Few Dollars More". Thanks to Ray Watts, I learnt that it once was the "Alamogordo Prison", where Monco (Clint Eastwood) liberates one of Indio's men in "For a Few Dollars More" so he can join his gang about to rob the bank of El Paso located at the Oasys set. Spielberg filmed the scene in which the father of Indiana Jones brought down a German plane with his umbrella shooing away a flock of seagulls. As these birds are difficult to lead, they had to bring pigeons. Hence the urban legend that says that today’s pigeons to be seen in the sandbanks are the descendants of those winged cinema stars. Another sequence of Indiana Jones and the Last Crusade, the one where the airplane gunned down a fleeing car, was recorded in Los Escullos, a beach dune embroidered with fossils. 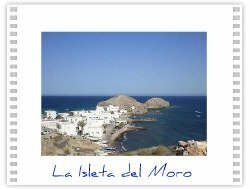 It is very close to La Isleta del Moro, a seaside hamlet with fishing boats stranded on the shore and white washed houses. 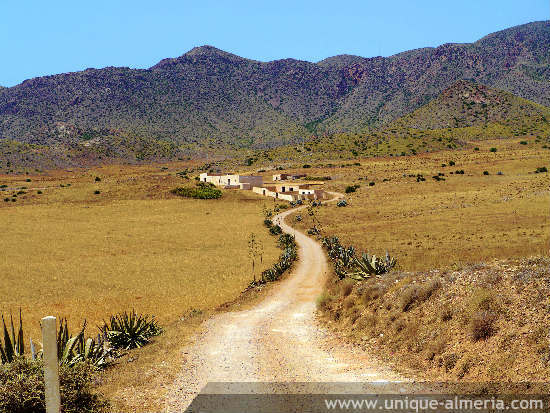 The Isleta had no electricity until 1969, no paved road until 1979 and no phone until 1982: the perfect place to be alone as intended by Carmen (Mercedes Sampietro) in the film 'El pájaro de la felicidad' (The bird of happiness). Passing La Isleta del Moro and the impressive Amethyst viewpoint, the road leads us into the red valley Rodalquilar, with its former gold mines and oxidized hills, which are not only ideal backgrounds for spaghetti western movies but also for science fiction films. A good evidence of the versatility of this scenario is the last movie shot here, namely 'The Reckoning' (2004), directed by Paul MacGuigan, starring Willem Dafoe and Paul Bettany. The list of movies shot in Almeria province is endless. Did I already mention 'Conan', shot in Almerimar? Not to forget: Almeria is one of the movie filming locations for uncountable TV spots! 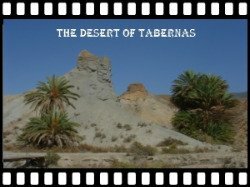 In Carboneras, the north eastern boundary of the Natural Park of Cabo de Gata, our route is paying a visit to the beach Algarrobico, where once stood a village of the most purest oriental taste, a faithful reproduction of the Jordanian city 'Aqaba', to give credibility to the adventures of the film 'Lawrence of Arabia'. Here also walked around John Lennon, as the protagonist of the antiwar satire 'How I won the war'. 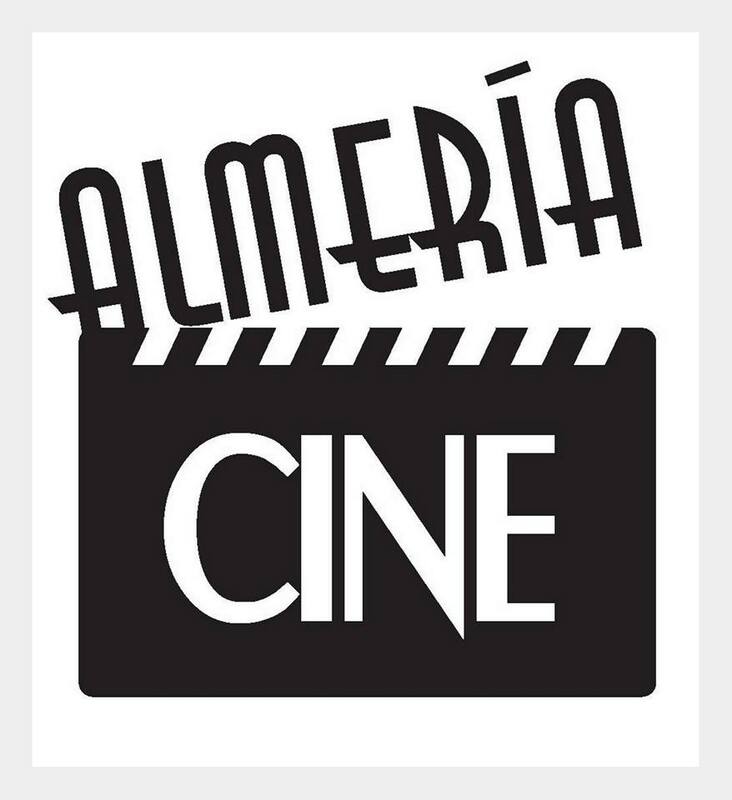 Check tons and tons of movies, clips and commercials shot in Almeria on the following (Spanish) websites. Click on the images and be surprised!